Dr Maria Flachsbarth, Parliamentary State Secretary to the German Federal Minister for Economic Cooperation and Development - welcome to Rwanda! The German delegation, our partners, KfW, the Mayor of Rulindo District and all of you - Mwaramutse! It’s my great honour to be with you today, especially because the role of the fund, beyond supporting the green economy and addressing climate change, is to be close to communities across the country, and today there is no better example than what we’re seeing today. Through the efforts of the residents of Rulindo District and the partnership between the fund, the district and KfW, the fund as custodian of resource mobilisation for green growth, we can see the impact of the funds that were mobilised and provided by KfW. Furthermore, the monitoring and evaluating of our investments is very important and so we are pleased to welcome you for this visit to Rulindo District. Your visit is testament to how important it is for you to see how we implement our projects. 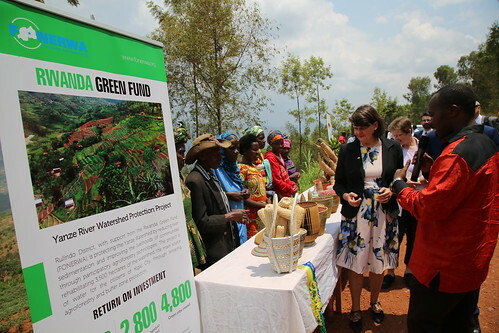 The Rwanda Green Fund is a groundbreaking environment in climate change investment fund. It is the first of its kind in Rwanda and serves as an example of what is possible in Africa and anywhere around the world. Our role is to be a solution for all development challenges, to mobilise climate finance, to support residents to adapt to climate change and promote green growth in Rwanda. The fund invests in the best public and private projects that have the potential for transformational change. And our goal is clear: we want to build a dynamic resource facility providing targeting financial and technical support as well as contributing to Rwanda vision of becoming low carbon and climate resilient economy by 2050. Our areas of interest are Conservation and Sustainable Management of Natural Resources, Research and Development and Technology Transfer and Implementation, Environment and Climate Change Mainstreaming and Environmental Impact Assessment Monitoring and Enforcement. Today, we are proud that five years down the road, we have mobilised close to 140 million US dollars from different sources around the world including the strong partnership with KfW. Through 32 active investments, the fund has seen 137,000 green jobs created, among them 82,000 jobs created for women and 54,000 for men. These investments have protected close to 20,000 hectares from soil erosion. More than 100,000 people have been supported to cope with the effects of climate change, and these investments have created an additional 40,000 hectares of forest and agri forest coverage. Almost 28,000 households now have improved access to green, clean energy. Our dear guests, this is what the fund has been able to achieve over the past five years. But we want to achieve even more, and for us to achieve more we need more resources. At the same time, we are working hard to become self sustainable, but for us to achieve that we strongly need your partnership and today, by looking at what is happening here, we hope you are convinced that the support given to the Government of Rwanda and to the Rwanda Green Fund is not wasted. Without doubt, it has contributed to Rwanda’s development. Thank you for your time and we thank you for being with us today. I’d now like to invite our Guest of Honour, Dr Maria Flachsbarth, Parliamentary State Secretary to the German Federal Minister for Economic Cooperation and Development, to give her remarks. Welcome.